Turnover Tracker is quick and easy to setup, and pricing is just as simple. Request a Demo for Turnover Tracker and start saving soon. Each OR that you track is just $1000 per year. An oft-cited study surveyed 100 hospitals around the United States on their operating fees. It found an average fee of $62 per minute in the operating room. Based on that figure, Turnover Tracker's Return on Investment starts after we've enabled the operating room to be used 80 seconds a month more than normal. 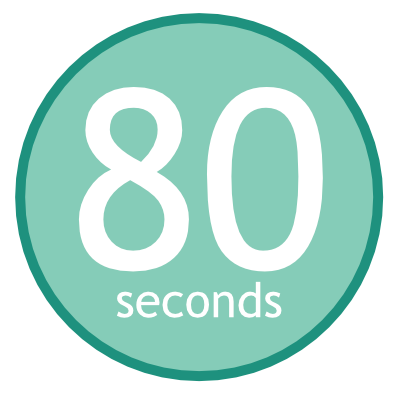 80 seconds is all it takes to save money. Request a Demo for Turnover Tracker and start saving soon. You'll be invoiced for the active rooms in your account. Invoices are due on a Net 30 basis. When rooms are added, you'll be invoiced for the additional rooms prorated for the number of months left in your billing year. Delinquent accounts are subject to deactivation. There are two types of notifications within Turnover Tracker - SMS and Email. SMS notifications are expensive. For that reason, each room has a notification limit baked into its yearly cost. The limit is 50,000 notifications per room per year. When the limit has been reached, your notifications will fall back to email. Additional notifications can be purchased on a per-room basis in 10,000 notification increments. Each package of 10,000 notifications costs $100. Purchased notifications will be used up before going back to free notifications. Email notifications are free and have no limit.